Ray Bans have been around forever. I remember my Dad's first pair of sunglasses were Ray Ban Aviators. Who knew they'd come back in style today - my boyfriend now owns a pair! Recently I became a little bit obsessed with Ray Ban Wayfarers, because I keep seeing them on (yes, you guessed it) Olivia Palermo. She wears the Ray Ban Original Wayfarer RB 2140. 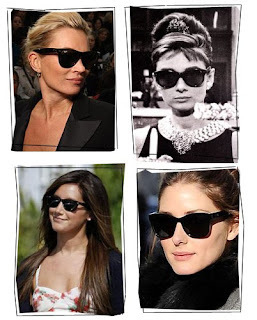 Celebrities like Rachel Bilson, Jessica Alba, Kate Moss, Ashley Tisdale, even the gorgeous Audrey Hepburn have all been seen wearing these sunglasses. 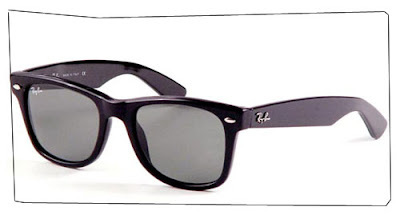 Don't forget the guys - Michael Jackson, Colin Firth, and Robert Pattinson are also fans of the Wayfarer. I couldn't help myself! I have a pair of Wayfarers flying to me all the way from Malaysia, thanks to my uber-cool parents. I am so excited! Just a little note to all you eBayers - there are many, many imitation Wayfarers on eBay. They don't state that they are not authentic, so look for items that expressly state that the listing is for an authentic Ray Ban Wayfarer.